The cats and kittens that are available for homing are housed in heated cat pens in the gardens of our fosterers’ homes. The cats that come into our care are first checked by a vet, treated for fleas and worms, given their first vaccination and neutered. Unneutered tom cats are tested for the FIV/FELV virus as these are the highest risk category. 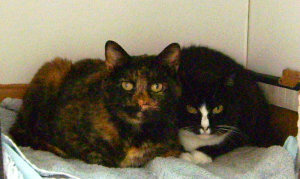 All cats must be given time to settle into their new home therefore patience will be required. Cats must be kept indoors with a litter tray for the first three to four weeks. 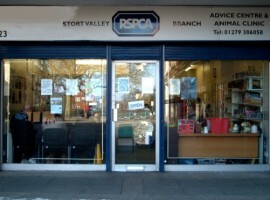 Annual vaccinations are required as are regular flea and worming treatments. With milder winters and central heating fleas are becoming resistant to products, therefore we only recommend products supplied by vets. These include Advantage and Stronghold for fleas. We also stock Indorex Household Flea Spray, which is a very effective flea control product. We stock Drontal tablets and Panacur paste for treating worms. If you are interested in giving any of our cats a home please contact the person named on each cat’s details. There’s no adoption fee for Golden Oldies – we just ask for a donation please. A home is for life. Not until they grow up, not until they get unwell. Please consider carefully all aspects of pet ownership before taking on a pet. We offer subsidised neutering vouchers to pensioners and people on a means tested benefit. Most of us at some time will have encountered a stray or lost cat, either just hanging around or more likely trying to find food. If you cannot take a lost or stray cat into your home while welfare enquiries are made, please provide food, clean water and shelter to prevent it from succumbing to hypothermia. 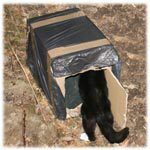 A simple cardboard box covered with a bin liner, and filled with straw or towels etc will provide adequate shelter. If you use towels they will need to be changed regularly in cold weather, as they become damp outside. Cat carriers (please remove the door) can also be turned into emergency shelters, as can increasingly popular plastic storage boxes. Polystyrene, newspaper and straw are good insulators to make a nice warm bed. Make sure your shelter is in a safe place, weighted down against the wind, or tucked under a bush for stability. Meanwhile you can bring the cat into our clinic or take to a local vet to be scanned for a microchip, you can look on Facebook local ‘lost and found pets’ pages and contact your local vets and animal rescue centres in case the cat has been reported missing. If the cat has not got a microchip you should ask for them to be added to our waiting list and contact other animal rescues for them to be taken in as soon as a space is available.